SKIWALKING.COM LLC and the American Nordic Walking System are dedicated to the fact that one-piece walking poles prove to be lighter, stronger, safer, more durable, more dependable and much more user-friendly than collapsible poles. So when Coach Edwards loads up and heads off to teach clinics and classes, he hauls bags of one-piece poles in a variety of different lengths. 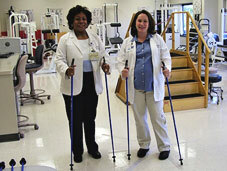 Taking collapsible poles would radically reduce inventory, but collapsible poles would reduce the quality of the experience for class and clinic participants. 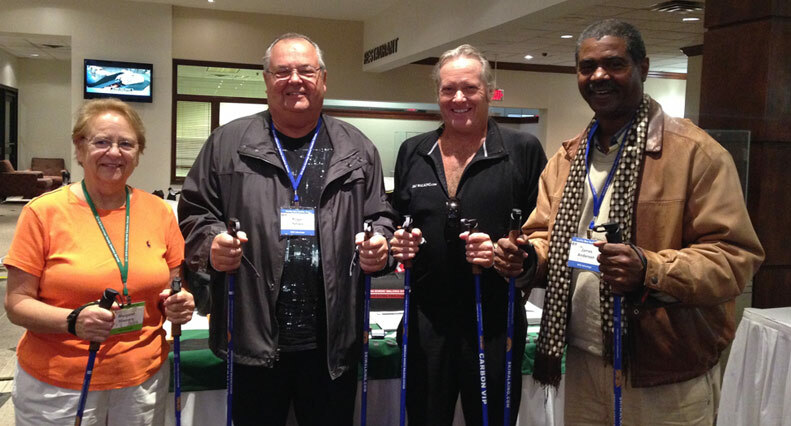 Coach Edwards has hosted hundreds of Nordic Walking Classes and Clinics across the country. He has personally strapped his quality one-piece SWIX and EXEL Nordic Walking Poles onto the hands of thousands of participants during his classes and clinics. Perfect Length Poles is a good thing. Twist-locks, flip-locks, push-buttons a bad thing. In 2019 SKIWALKING.COM LLC and the American Nordic Walking System will launch the first Nordic Walking Instructor Training Program here in the USA that parallels that of the Professional Ski Instructors of America (PSIA). When Edwards received his Nordic Walking Certification 10 years ago, he was embarrassed because the course and so lame. * check back for Nordic Walking Class, Clinic and Instructor Certification dates.